Colorless is an artsy 2D puzzle platformer game where our character appears in a black and white world, ventures forth, and suddenly discovers color… and its inherent abilities. With this discovery, our character gains a new power that allows them to transverse further into the world, pushing boundaries, coloring the environment, and watching it slowly becoming beautiful and lively. However, at the same time, it appears the world is also sending our players a message… and perhaps, unveiling to us why the world was black and white in the first place. Learn more about my personal design contributions below under "The Design and Development of Colorless" ! I was the Team Lead and Designer for this project and we aimed to create a visually compelling experience that invoked feelings of wonder, awe, and curiosity. The game is all about creating "the feels" and providing an immersive and relaxing experience. I say, put on some headphones and get ready to play our game at the link provided above! High Design Concept: "The Color Story"
The main design concept was to tell a transitional color story to convey emotions and narrative. The color concept and determining the four colors meant that we were going to create four mechanics, four levels. Each color level represented the introduction of a mechanic, teaching the player how to use the mechanic, and combining powers in a way to further transverse in the world. 2) Each ability goes hand-in-hand with level design/world concept which I will explain further in its dedicated section. Once a mechanic was introduced, it was a matter of teaching the player the mechanic and scaling difficulty at the right pace. Through playtesting, we observed how players tried to solve each puzzle, their ability to quickly understand it, and had them discuss their frustrations and lack of clarity if they had difficulty figuring things out. Gameplay design is directly tied into level design as each level needed to communicate the placement of player versus object versus camera view versus texture/color indication. 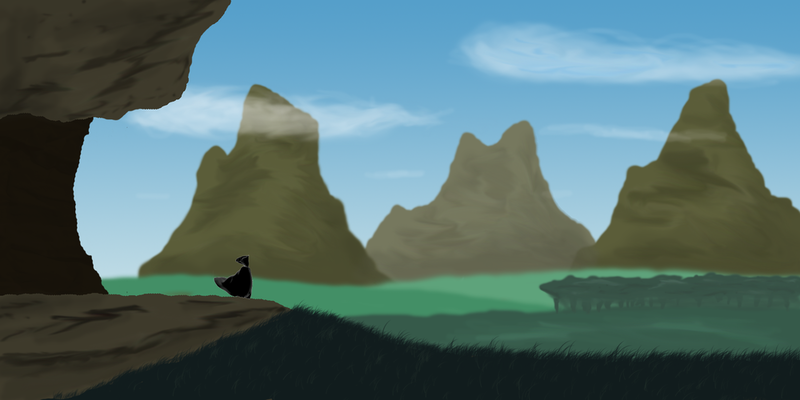 The open cliffs of the mountains to wall jump around, showing off the green trees/forest, the drop/interruption of the caverns and its darkness for yellow/spirit child, emerging to see a beautiful world, to the low point of the game where you are in a valley and hopping through canyons watching the world drop to red. (Also the world dropping towards sunset for an ending for symbolism). Every single thing ties back into this color story we've aimed for. Color Narrative + Mechanic + Levels are all directly related to one another. I had a great time planning out the environment and appropriate puzzles to balance all those two things. Understanding what environment/terrain occurred at what color and mechanic was very important for the overall experience. Using the initial design concept, all of the puzzles, levels, and environment needed to relate and work together to make an immersive experience. In this project, level design meant puzzle designing, too. Knowing the four mechanics and the general idea of the world and its terrain, I had to design each color level to teach the player how to use each mechanic and scale the difficulty in a fair way. 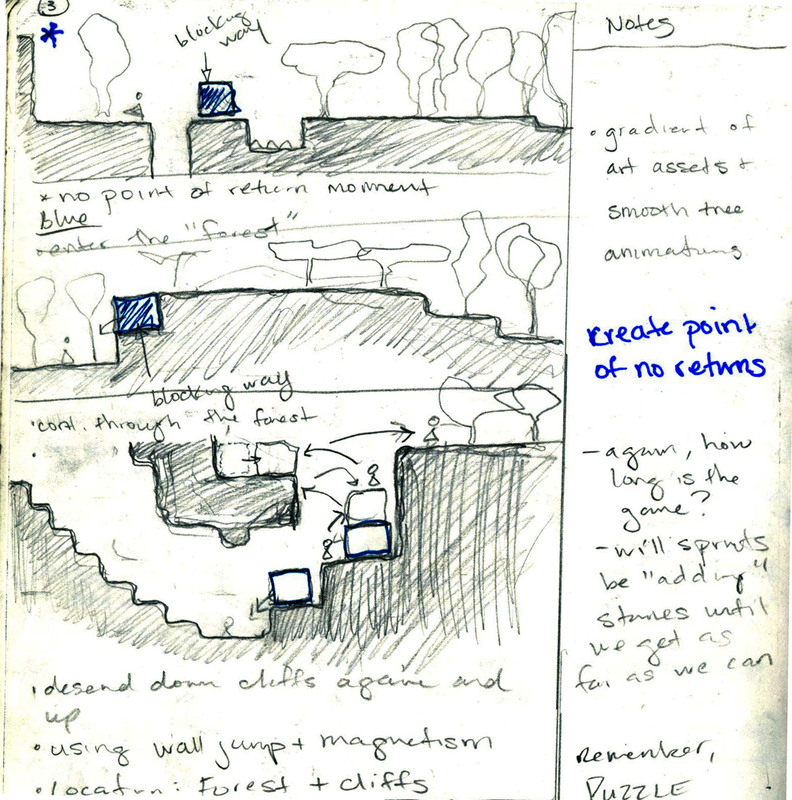 I scanned images directly from my sketchbook showing my design, process, and notes on how I designed some of the levels. For example, with the blue mechanic, Magnetism, we had to teach the player that they could interact with block objects and push them back and forth. So the level was fairly flat but had a voids in certain parts of the level to show that it could be pushed into a "slot". Soon, we would place the blocks in a manner that players needed to stand on them and push themselves to bypass longer spike/death zones. We found that many of them enjoyed "joy-riding" on blocks using this power which is always a nice plus. It was about difficulty progression but also emotional progression and wow-factors of using each ability so it was important for me to storyboard each level. 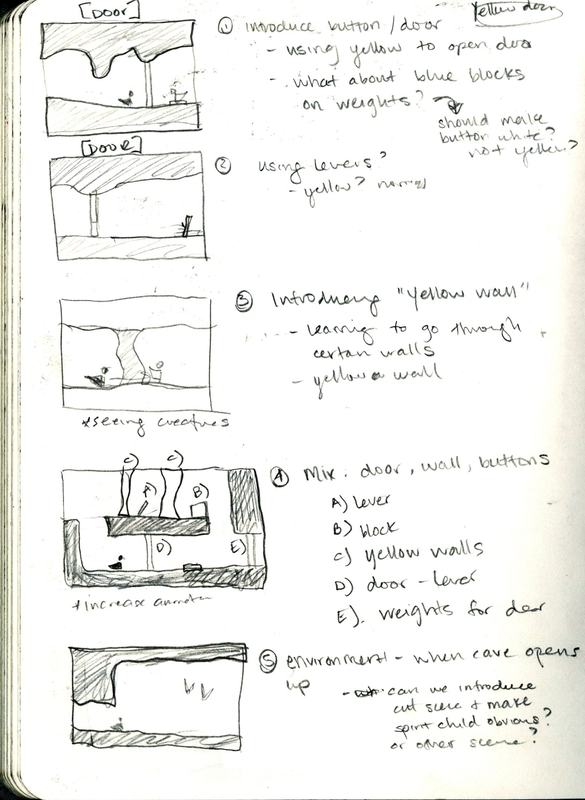 Level designing in Colorless meant design, implement, test, reiterate. Not only did I just have to design the puzzles, but I created all the art assets in Photoshop, import them into Unity, build the scene, and then had both teammates and playtester give me feedback to improve each level, each puzzle, each zone. We wanted to create a solid experience by challenging our players in the puzzle but also not break their immersion of the world we created. And as a team, we had a clear vision and experience we wanted to create so we did all we can to meet those emotional and aesthetic goals.